Indoor Greenhouse Kits | Portable Units | Free Shipping! Indoor greenhouse kits make wonderful gifts for any green thumb! An indoor greenhouse won't take up much space---just a tabletop or shelf. 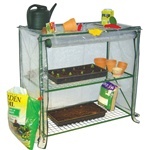 We offer indoor greenhouse kits in a variety of sizes. Indoor greenhouse kits help you get an early start on the growing season with early planting in the spring while it's still too cold to plant outside. With a small indoor greenhouse, you can grow your biggest and best flowers and vegetables this year! Get free shipping on all gardening products from Home Products 'n' More! If you're looking for other gardening products, you've come to the right place! Home Products 'n' More is your complete stop for everything gardening related! To add a touch of elegance to your yard or garden, check out our complete line of arbors and trellises. We offer arbors in durable vinyl that weather well and never need painting. We also offer a line of high quality aluminum trellises ranging in sizes from 2 foot to 9 foot tall! Aluminum is a lightweight material that won't rust, making it the perfect material for a metal garden trellis. All our aluminum trellises also come with unique training clips, designed to get your plants started and help them climb. You might also be interested in our line of outdoor furniture products. Home Products 'n' More offers a complete line of weatherproof garden furniture such as picnic tables, chairs, outdoor porch swings, and more. At Home Products n' More, we understand how important your home is to you. That's why we offer the best products for your home and garden at reasonable prices, and always with free shipping and handling! That's right---order as many units as you like, the shipping is still on us!